Keep your CT home warm and cool with an all in one system! Ductless installation done in Branford by your friendly neighborhood HVAC company! Tired of needing two different systems for heating and cooling? Air Inc. Heating and Air Conditioning has the perfect solution for you. Our ductless heat pumps and mini-split systems provide both air conditioning and home heating. Heat pumps and mini splits also require no ductwork. Since most energy is lost while traveling through ducts, this makes the system far more efficient than traditional ducted systems. Thus you benefit from increased efficiency and convenience! In fact, ductless systems can even be used in conjunction with an existing HVAC system. Interested? Our HVAC experts can quickly and efficiently install a ductless heating & cooling system of your choice. Contact us today and schedule your free estimate in Branford, North Haven, Guilford, and nearby! Line hide during and after a ductless installation in Watertown, CT! Ductless systems give consistent year-round indoor climate control by providing air conditioning and/or heating for a single room or multiple zones throughout the entire home. Temperatures in Connecticut can be fickle and unpredictable, but ductless systems can adjust quickly to the temperature outside and evenly distribute home heat or cooling. Energy Star® rated ductless units also operate using up to 50% less energy than traditional HVAC systems this alone will save money on your overall utility bill. So not only will your system handle all types of weather, but it will also do so affordably. Get started today with a free cost estimate on a ductless HVAC system! Air Inc. Heating and Air Conditioning can help you improve your home's heating and cooling. The ductless heating and cooling systems we install are extremely energy efficient and easy to install. There will be no hassle getting your system in place, and even less once it's in place. 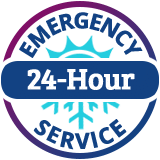 Contact us today and schedule your free estimate in East Haven, Madison, New Haven, Hamden, West Haven, Milford, Woodbridge, and nearby Connecticut!